From the time, he was born until the day he married I prayed for him and his future wife. I prayed, as he waited for the young lady God had picked for him, that he would grow in his relationship with the Lord. I prayed for the Lord to teach Him through His word how to be a godly husband and one who knew what it meant to be the head of his household. I prayed for the young woman who would someday be his wife. I prayed that God would grow her into a godly wife and teach her the Biblical definition of what it means to be a submissive wife. God has answered my prayer and my son Andrew has grown and is still growing into a godly man. Katie my new daughter is a godly young lady and still growing as well. The day of their 1-year anniversary I found myself with tears, happy tears, praising God for their past year of marriage. What a blessing to see a young married couple grow in their relationship with one another and in their relationship with the Lord. I found myself thinking about how to pray for them as they move forward into their next years of marriage. 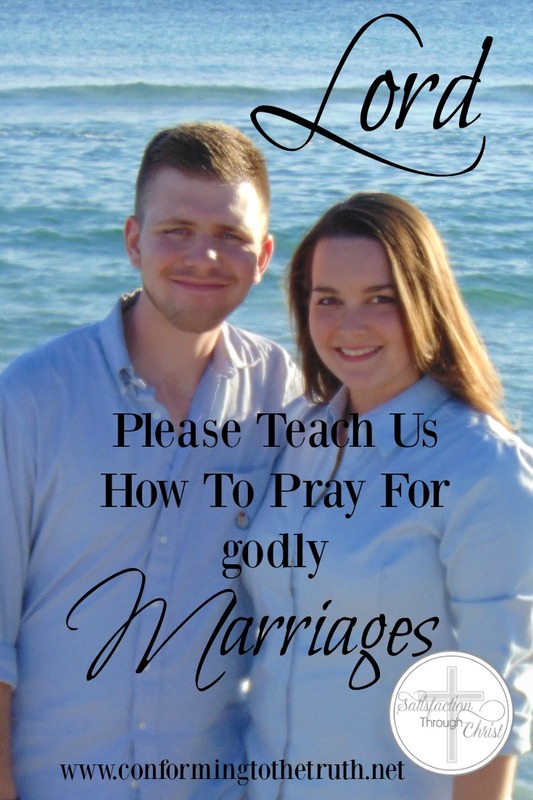 I have made a list of ways to pray for them individually as well as a couple. I have taken Scripture and turned them into prayer. These prayers do not just apply to a newly married couple they can be applied to marriages of all stages. and even your grandsons and granddaughters! Pray that they walk in a manner worthy of the Lord. Pray that God will strengthen them with steadfastness and patience. Each person in the marriage relationship has their own God-given responsibility. But at the same time each one must strive to understand the responsibility of the other. The verses I have picked for this prayer: Colossians 3:18-19, Ephesians 5:22-23, Ephesians 5:25, Ephesians 5:28, Ephesians 5:33. Pray he understands and respects the wife’s role of subjection. Pray for understanding of Christ’s headship in the marriage. Pray for understanding of Biblical subjection. This list of prayer is only a small way in which we can pray for godly marriages! What are some ways you have prayed for marriages? I would love to hear them! If this list has helped you would you please share with others. I believe prayer is the best thing we can do for our marriages. Great post and encouragement! Thanks. Thank you, Starla, for your kind words! You are very welcome. I am grateful that it was encouraging:) God Bless!